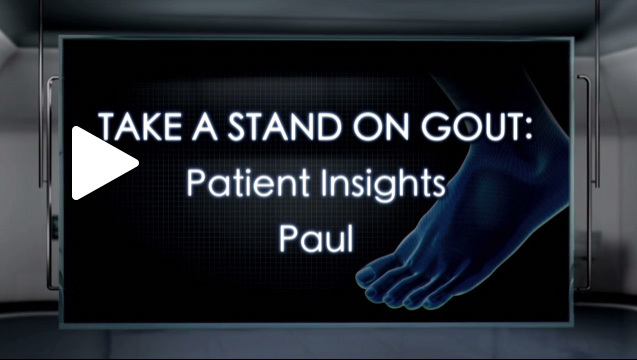 PR Newswire, PITTSBURGH, May 19, 2016 A new survey from the Gout & Uric Acid Education Society (GUAES) finds many Americans with gout may be placing too much emphasis on diet when it comes to managing the disease and controlling painful flares. 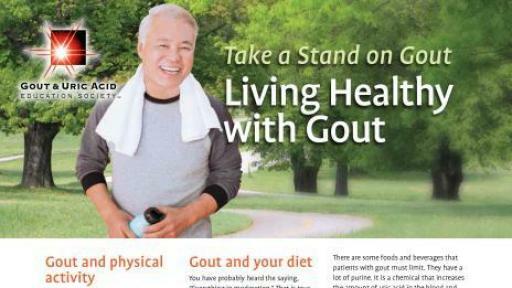 Of all the steps taken to manage gout, respondents cited changing their diet by eliminating or reducing consumption of certain foods as their top step taken (50 percent)—even ahead of taking medications to lower their uric acid levels (40 percent) and maintaining an overall healthy fitness level (33 percent). 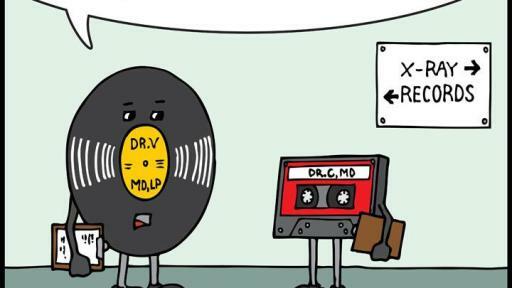 Furthermore, nearly one in three with gout incorrectly believes that the disease can be completely avoided by eliminating certain foods; and more than one in four said they would not take medications if they were making dietary changes. Gout is an extremely painful and chronic form of inflammatory arthritis caused by elevated uric acid levels. Over time, uric acid can accumulate and form crystals in the joints and other tissues—leading to painful flares. 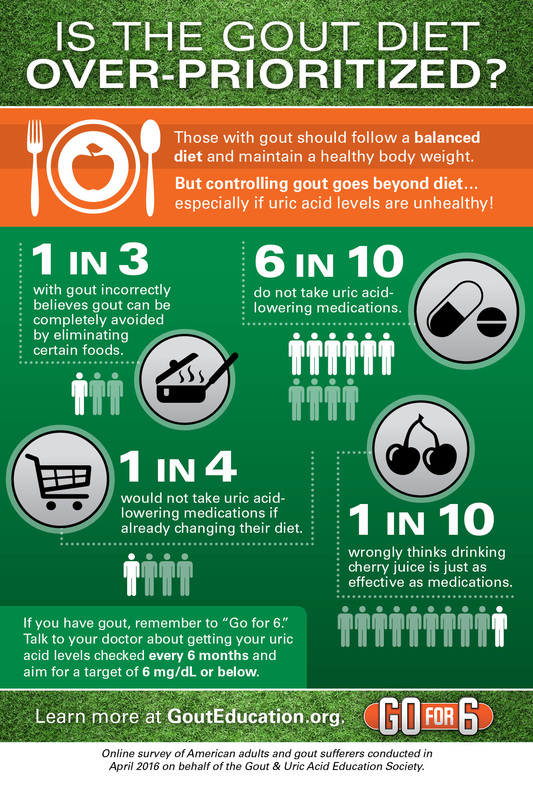 Untreated, gout can lead to permanent bone, joint and tissue damage, and other serious health issues, including kidney disease, heart disease and diabetes. 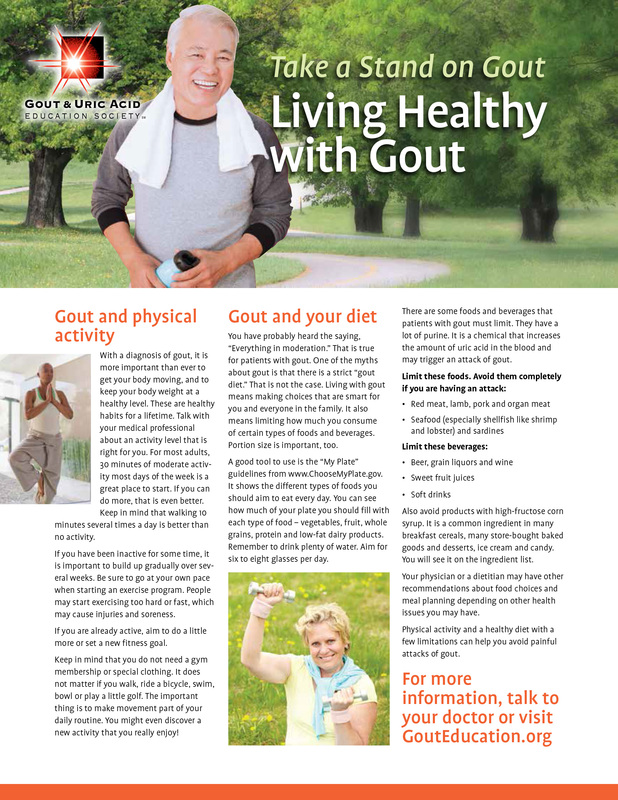 In conjunction with Gout Awareness Day (May 22), GUAES is urging gout sufferers to learn more about the disease, seek immediate treatment and take ongoing steps to manage gout—with the most important step being to check uric acid levels regularly (every six months) and aim for a healthy target of 6 mg/dL or below. 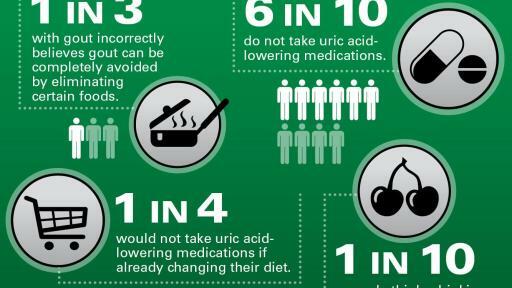 While uric acid-lowering medications are typically needed to control gout and reduce future risks, those with gout should also make lifestyle changes—which includes following a healthy and balanced diet. 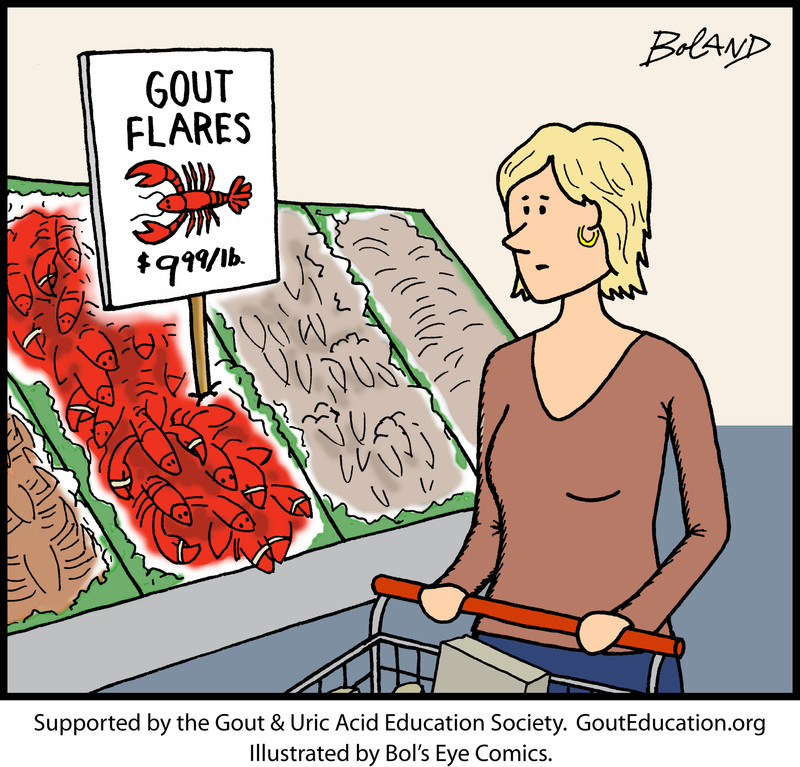 There isn’t a regimented gout diet, but those with gout should make healthy food choices and may need to reduce consumption of certain foods. 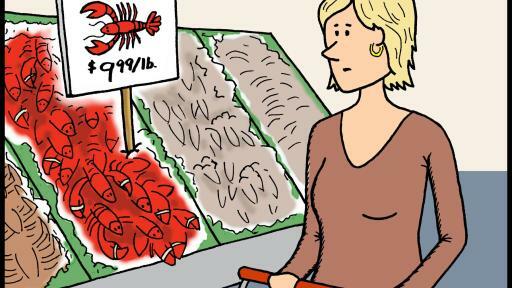 Because uric acid is formed from the breakdown of purines, foods high in purines—such as beer, red meat and shellfish—have been known to trigger gout flares. Foods containing high-fructose corn syrup—including soft drinks, sweetened juices, pastries and processed foods—should also be avoided or eaten in moderation. 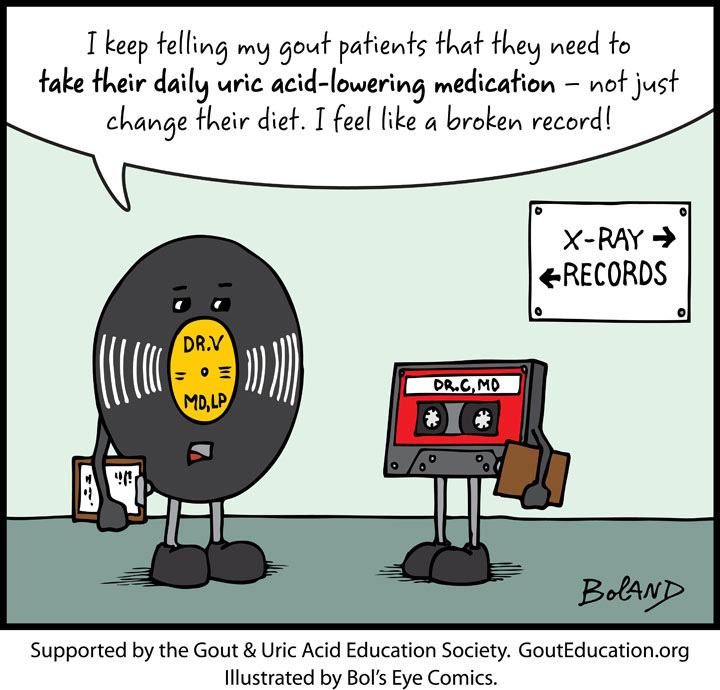 Those with gout are instead encouraged to eat fresh fruit and vegetables, low- or no-fat dairy products and nuts and grains. While cherry juice is often in the news as a potential treatment of gout, Dr. Edwards urges gout patients to take steps beyond adding this to their diet. The GUAES survey found that nearly one in six gout patients (16%) believes that drinking cherry juice is just as effective as taking uric acid-lowering medications. 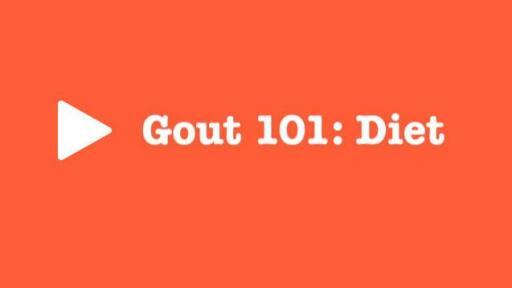 For additional information and resources about gout and diet, and other topics, visit GoutEducation.org. Online survey of 1,000 nationally representative Americans ages 18+, with an oversampling of 103 interviews of adults who have been diagnosed with gout. Conducted April 11-18, 2016 by Wakefield Research on behalf of the Gout & Uric Acid Education Society.